December 1960 cover. 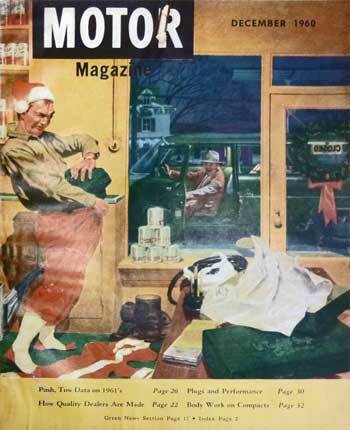 A garage is closed and the mechanic is donning a Santa suit when a motorist drives up in a green station wagon yelling for service. Painter/illustrator/print maker William Taylor Oughton was born March 29, 1925, in Glenside, Pennsylvania. In 1943, he graduated from Abington High School in Abington, Pennsylvania, where he had been on the art staff of the school yearbook. From there, he had planned to attend Ursinus College in Collegeville, Pennsylvania but World War II was raging, so he joined the Marines instead. While assigned to Asian climes, he started drawing portraits of officers. After the War, casting about for what he wanted to do for a career, he decided to pursue art. For nearly fifty years his illustrations have appeared on covers and inside stories for magazines such as Readers' Digest, The Saturday Evening Post, Field and Stream, Cosmopolitan, True West, Pennsylvania Game News, Amazing Stories, Boys' Life, Frontier Times, Fantastic Science Fiction Stories, The Wide World, Old West, and Outdoor Life. His work for MoToR appeared in the early sixties. While nature and wildlife are his greatest interests (in the seventies, for instance, his illustrations appeared in the Boy Scout Handbook), he has illustrated a wide range of scenes through the years. His illustrations tend to be of people, landscapes, and wildlife, and he has said that inspiration has come to him through a photograph, a dream, or even an interesting rock. In 1968, Oughton illustrated a number of Classics comics. Titles included: Don Quixote, Rip Van Winkle, The Pioneers, Bret Harte's Western Stories, The Red Badge of Courage, Alice in Wonderland, Ben Hur, and Joan of Arc. Books for which he has illustrated include these: Who Rides with Wyatt; The Secret Horse; The World of Animals; The Cat That Overcame; Snowfoot, White Reindeer of the Arctic; Duck Grows Up; I Love My Brother; Hi Fella; Bob, Watchdog of the River; The Lonesome Sorrel; Flash, Dog of Old Egypt; Boy and a Deer; The Flint Hills Foal; I Love My Sister; Mallard Duck at Mountain View; Penny: the Story of a Free-Soul Basset Hound; Big Box of Backyard Animals; and The Dog Who Came to Stay. Oughton has also authored or co-authored books such as, Loon at Northwood Lake; Mallard Duck at Meadow View Pond; and coloring books--Great African-American Athletes and Great African- Americans. There have been commercial advertising commissions, as well as poster and calendar work. A member of the Woodmere Art Museum and the James A. Michener Art Museum, Oughton has had numerous exhibits and has won significant awards from, among others, the New York Society of Illustrators, the New Jersey Art Directors' Club, the Delaware Valley Artists Guild, the Society of Animal Artists, and the Philadelphia Art Directors' Club.